After more than a decade living and traveling in S.E. 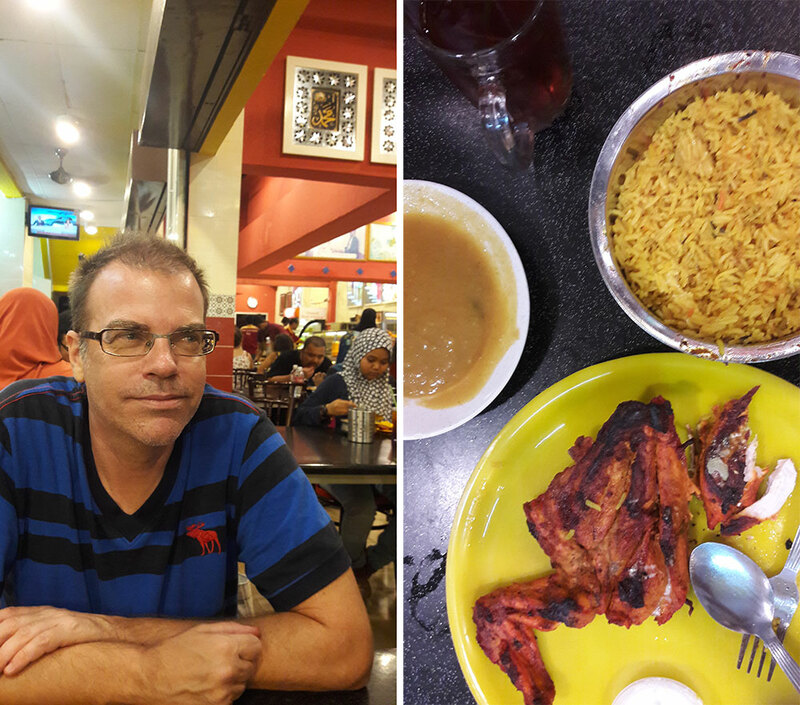 Asia, I finally ventured to Penang, and what a discovery it was. 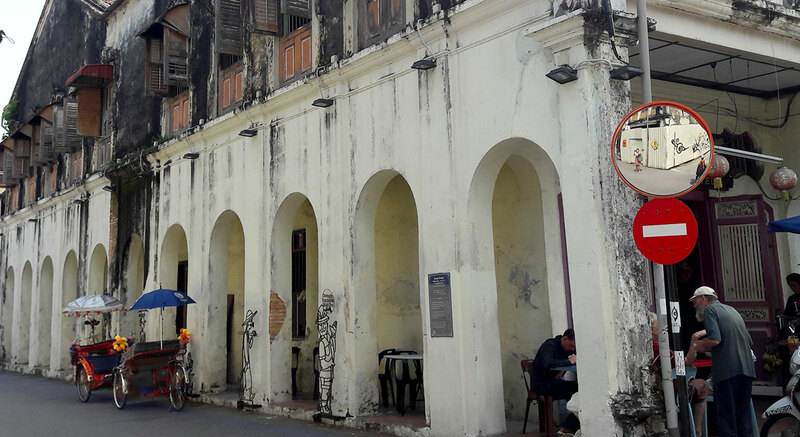 My observations of the more special aspects of Penang are based as much on my brief visit as on my experience of other Asian countries: China, Thailand, Cambodia, Vietnam, Laos, Hong Kong, and Burma. I’d thought I’d seen what S.E. Asia has to offer, and Malaysia would be a slight variation on the theme, but I was wrong. Georgetown doesn’t feature the sort of jaw-dropping attractions that Siem Reap does, or the adventure of ascending Western Sichuan to the border of Tibet. The experience there is more of the laid back absorbing of the local colors and flavors variety, and without most the drawbacks of journeying through other S.E. Asian destinations. The main attraction is the rich mix of Muslim, Indian, Chinese, and Colonial influences. Just show up. 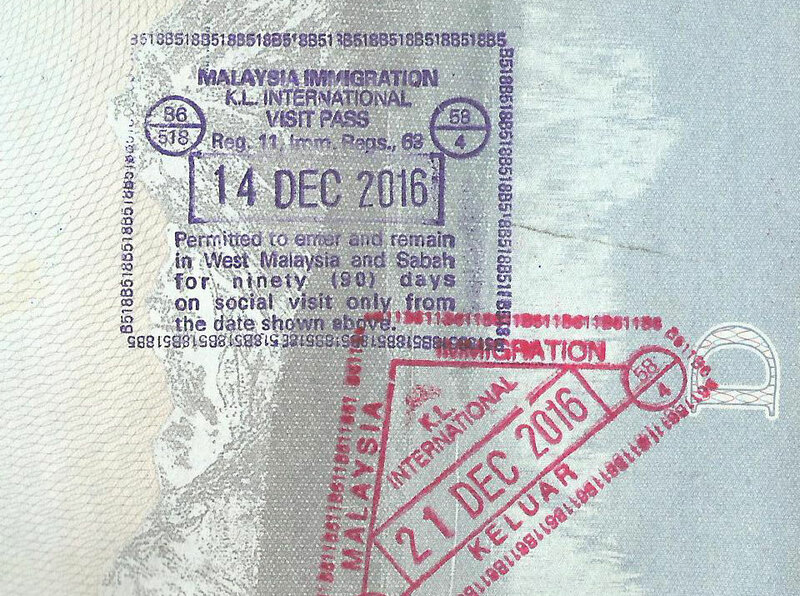 Malaysia has the most lenient visa situation I’ve heard of in Asia. Not only do you not need a visa (if you are American, British, Canadian, Australian…), you get a permit on arrival to stay for 90 days, and you don’t even need to fill out an arrival card on the airplane. You don’t have to know the address of where you are staying, or how long you are staying, or any of those sorts of things you may not be sure about, in which case you don’t really know how to fill out the form. Below is the visit pass I got on arrival, good for 90 days, and then the departure stamp. Only two small stamps to fill up your passport. Only citizens of a handful of countries have to apply for a visa, including China, India, and Pakistan. Significantly, these are countries whose citizens could most seamlessly blend in, so I’m guessing they are trying to prevent illegal immigration. I’ve never seen these before. In Saigon (where I worked for a half year) or Siem Reap (where I now pleasantly reside) sidewalks are desperately needed motorbike parking spaces, and are used predominantly as such. Walking is not always a workable option, especially in Saigon. The cool, shaded corridors of Georgetown, with their elongated two-point perspective views are a luxury. There were also ample sidewalks most places I explored, and overall the city is conveniently traversable by foot. Here’s one from the outside. Note the shutters above. It’s difficult to get lost in Georgetown if you happened to pick up one of the several varieties of free maps you can get just about anywhere. You might have to walk a block or so at the most to read a sign and then find yourself on the map. One can appreciate this if one has been lost before, say, in Thailand, where there wasn’t a street sign in site and the locals navigated by fruit stands, where they once saw a snake, and instinct, and thus couldn’t tell you the name of the street you are on, even if you clearly asked them in Thai. After living in China for over 4 years I went home to visit California. On my first morning back I went for a little walk, and while I was walking across a street, a car slowed to a stop to let me pass. I laughed out loud. In China the drivers would accelerate while leaning on the horn to let me know they were coming through and I’d better get out of the way if it meant a dead sprint for dear life. This is a lesson I learned my first afternoon in China, when a taxi barreled down on me blaring the horn as I crossed an intersection, with a blinking walking signal. The pedestrian is always not just wrong, but a vile cretin. One can experience similar, but less consistently assertive driving in Vietnam, Thailand, and Cambodia, so, politeness behind the wheel is an extraordinary gift when it occurs. 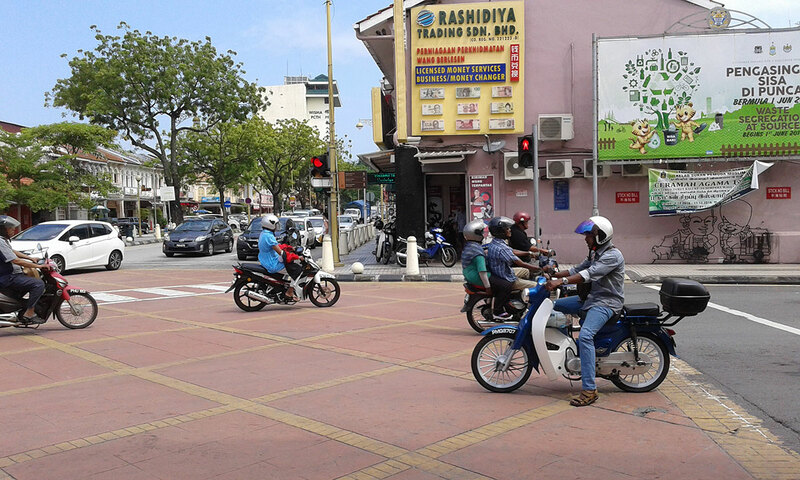 Motorcyclist waiting patiently for the light to change. Note the decorated road in the intersection and tree-lined islands. Oh, blessed be. The first time I went to Thailand I rather liked the novelty of the tuk-tuks (three-wheel motorcycle taxis), and thought chugging down exhaust while being carted around in an over-sized, cacophonous lawn-mower was fun. But that was a short vacation. Once you live in a place, well, squadrons of loud lawn-mowers bellowing plumes of black smoke while they circle their territory looking for green victims to gouge looses all appeal. There was a tuk-tuk-shaped stall selling some product in the airport in Kuala Lumpur and I flinched upon seeing it. 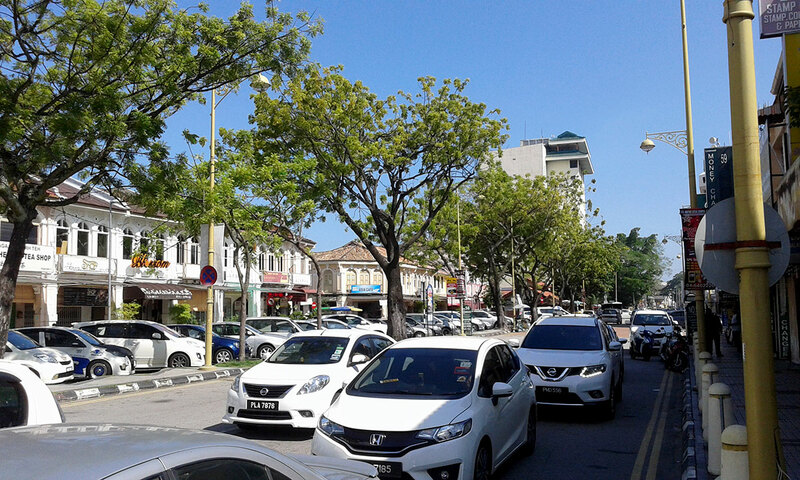 In Penang there are no dtuk-dtuks that I saw, which means none harassing you. In Siem Reap, well, try to walk a block or two downtown without getting asked repeatedly if you want a tuk-tuk. Because of this there are T-shirts that say, “No tuk-tuk or massage today or tomorrow”. Below is a pic I took of a typical tuk-tuk in Thailand in 2005, not long before their charm permanently wore off. There is the much more appealing option of using cycle rickshaws. Between walking and taking buses the traveler can be completely independent, forsaking any and all overcharging and scams related to transport and tours. This is an enormous boon if you like to explore on your own, dirt cheap (I didn’t pay more than 50-75 cents for a bus trips up to an hour long), at your own pace, and in your own way. 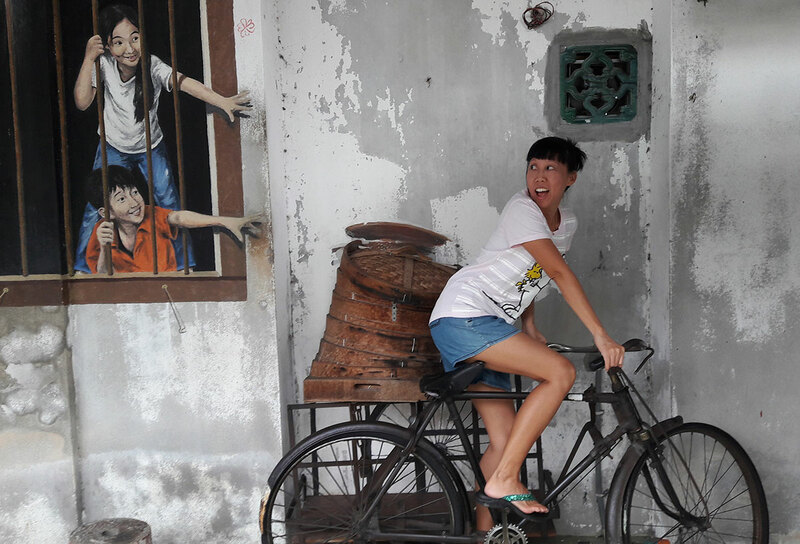 You can practically get anywhere you need to go in Penang without any hassle. Of course, buses are buses, and sometimes you have to stand, or wait, or smell the people around you. Some cities, like Chiang Mai, are virtually without functioning buses, in which case you just have to take a tuk-tuk or song theaw (pick-up with two benches to sit on in the back), and attempt to negotiate down how much you are being overcharged. 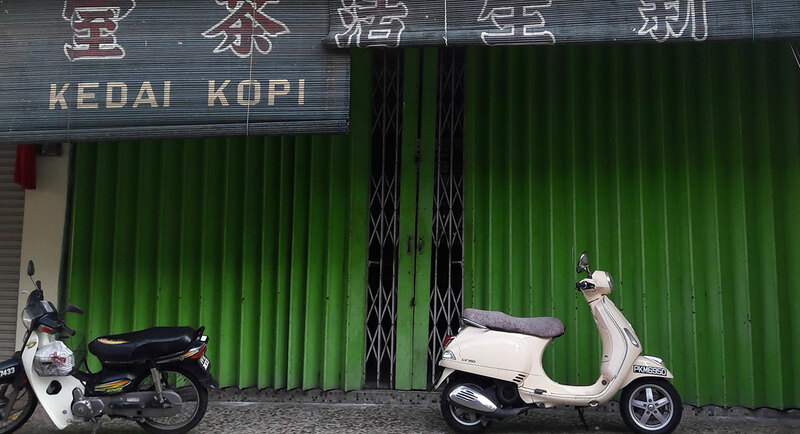 Any fixed price is coveted in Asia, but when it applies to transportation, it’s priceless. This was only really a problem for me in un-touristed parts of China, which is where I happened to live. I would be called “lao wai” (foreigner) or “wai guo ren” (outsider) or “mei guo ren” (American) everyday, and if I were out and about, many times in a day. It was as if people couldn’t resist, and as soon as they spotted a lao wai they had to notify everyone around them, at which point they echo the cry. Occasionally one gets called “Farang” in Thailand, but, as compared to the treatment I got in China, it’s like the difference between a mosquito bite and a chronic case of the chicken pox. I also had this in Burma, so I gather it’s a British influence. 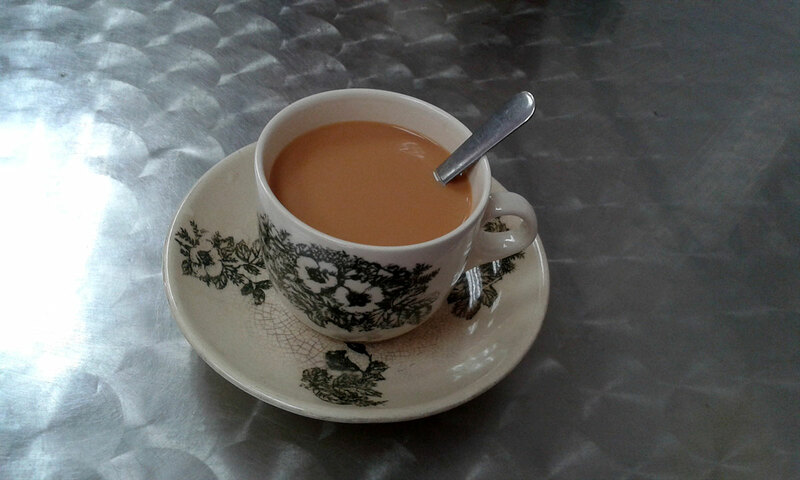 My god the tea is good, and I’m talking the 50 cent variety, using condensed milk. I’ve tried to replicate it since getting home, with Lipton’s and condensed milk, but it just doesn’t have the real spark. I love my milk teal, and twice ordered two back to back. Did I mention the milk tea? Another cup is in order. 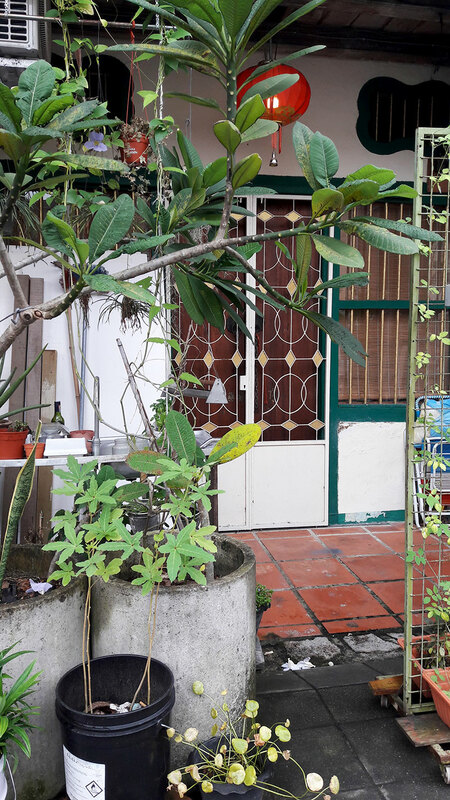 Many homes and businesses kept artfully arranged plants outside. It seems a common hobby, and one which I find endearing not just for the greenery, but because I practice it myself. 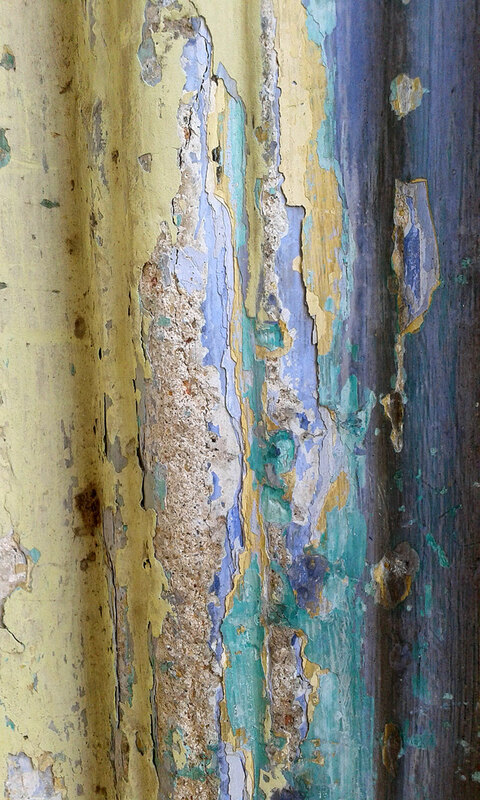 This is a small touch, but, a little care to decorating ones storefront is the difference between being welcoming and exuding an aura of harmony, versus unadorned, gritty functionality. 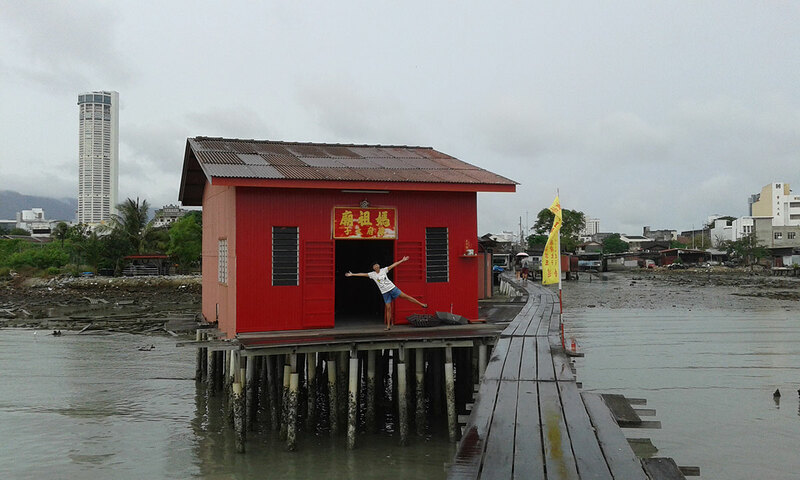 These are Chinese watery mini-villages on stilts, dating back a century, each jetty named after its respective clan. One is completely commercialized, others not at all. A bit unusual and colorful, they are a nice way to walk out over the water on elevated wooden paths and get different vantage points. Dare you walk out on the planks to the end? View looking back to the shore. Looks like I got photobombed. Yellow boat with another jetty in the background. Note houses are on stilts. 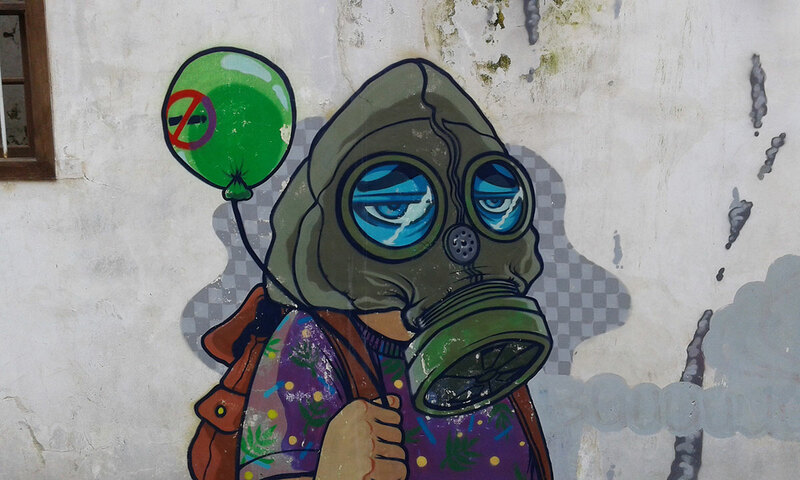 Mostly used as backdrops for selfies, and some designed for that express purpose, paintings adorn the walls of buildings throughout a section of the city. Lani had to try it. One of my favorites. I like the eyes, the shading on the balloon, and that the shadow is checkerboard. Another favorite. 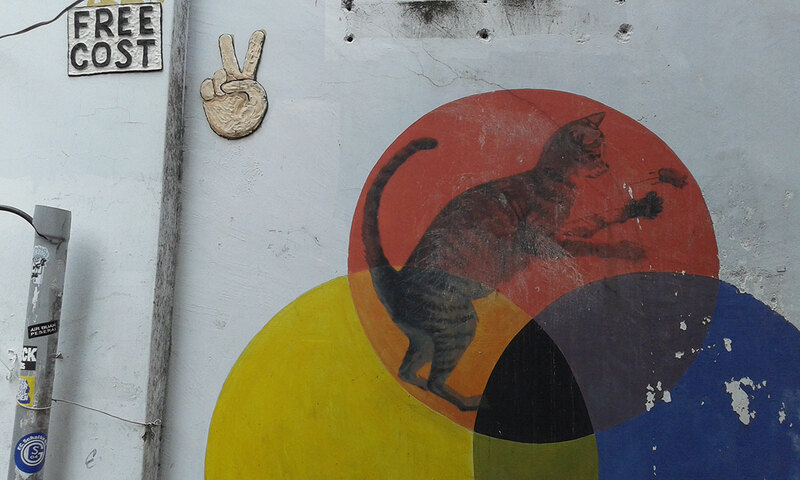 Why the cat in the intersecting color circles? I don’t know, but it’s cool, and I like it. I have a really hard time not making faces in pictures. Here I was given free reign. 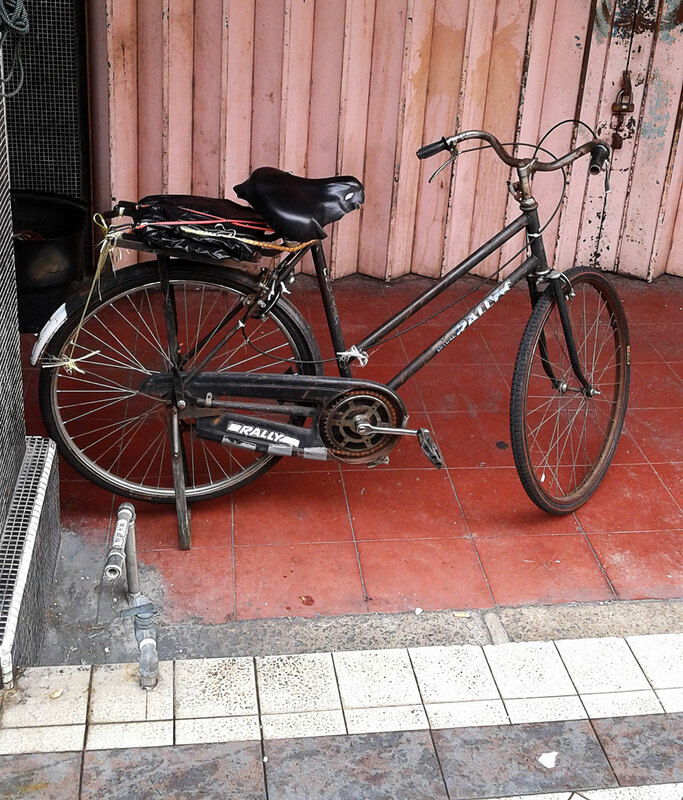 Always a welcome site in Asia are the utilitarian varieties of bikes, in various states of ageing. They mean people are still using them for practical transportation. On top of that, by sticking with the old ways, they are now ahead of the curve, as in the most developed countries people are opting to ride bikes instead of drive for health and environmental reasons. Plus, I love riding bicycles, and bicycles in principle. 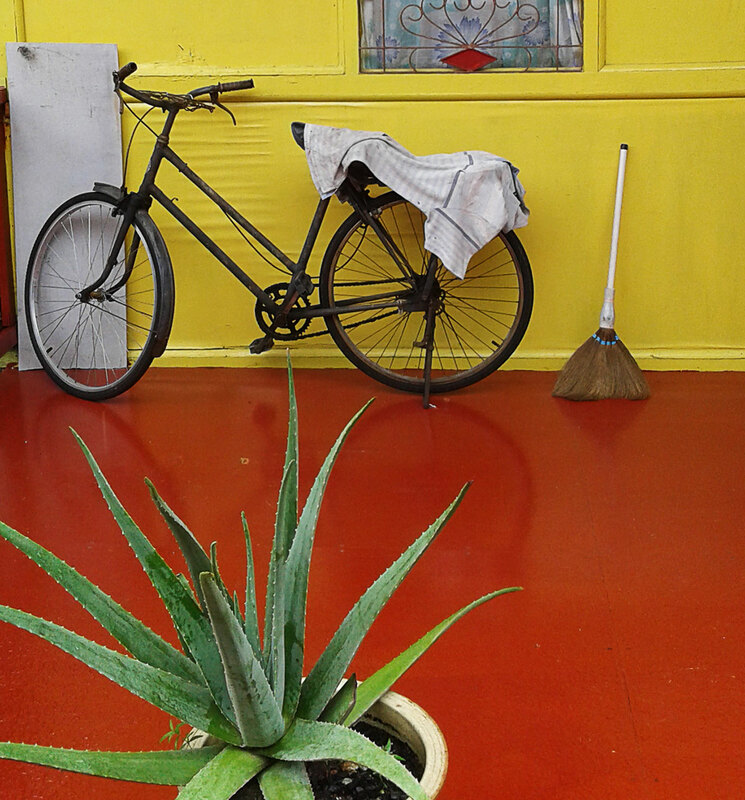 an old bike, outrageous color, and a big aloe plant all in one. This photo’s from one of the Clan Jetties. And there are bike lanes. 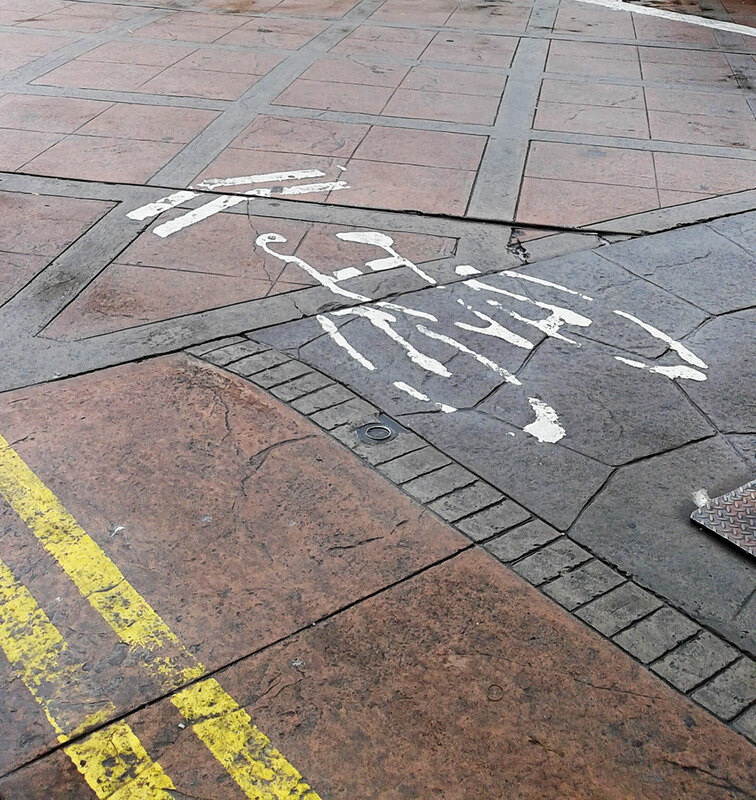 Is there anything more civilized these days than bike lanes? 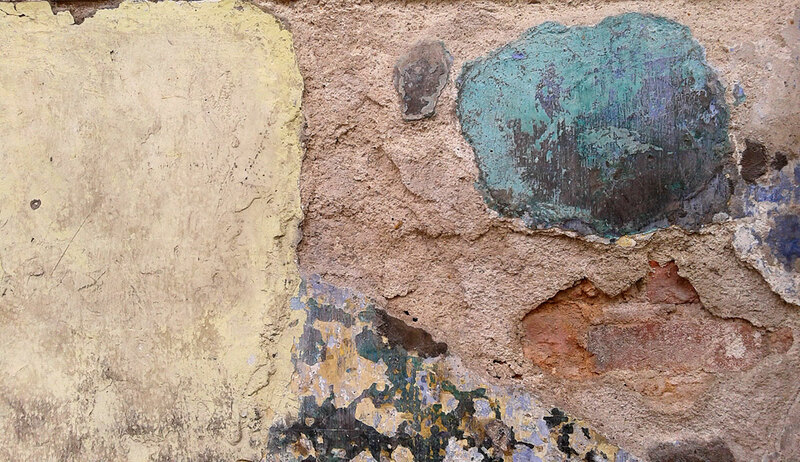 There’s a lot of gratuitous covering walls with a fresh coat of bright color, and then there’s the weathered walls with prior layers of paint showing through (such as you might see a lot of in Hoi An, Vietnam). Why not make it green? Or yellow, which makes a fashionable 70’s backdrop. I used an app to learn some Malay language before going, not that I ever needed it. There are two things that make it extremely easy as compared to other Asian languages I’ve studied (Chinese, Thai, and Khmer). One: it uses Roman letters. Oh, the joy of that. And you can quickly figure out the phonetics without even trying, because they use a lot of English words. For example, at the airport one sees “Kaunter” and the English translation, “counter”. “Klinik” is “clinic”. “Farmasi” is “Pharmacy”. All hard “c” and “k” sounds are just “K”. And “c” is used for “ch”. No “ph” for “f”. No funny spellings. Secondly, the language is not “tonal” like Thai or Chinese. Tones are the way a vowel goes up and down to change the meaning of an otherwise identical sounding word, causing endless confusion. In Thai that problem is doubled with long and short versions of the same word with the same tone. I learned to read and write Thai, which is no mean picnic. In comparison, my oh my, Malay is a joy. 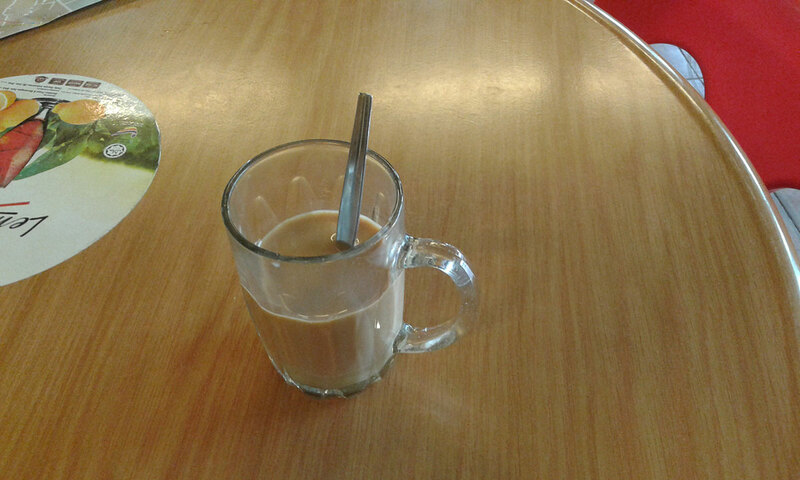 “Kedai Kopi” just means, “Coffee Shop”. So easy to learn. The beautiful Chinese characters above, not so easy, not so easy at all. I’d really like to make bahasa Melayu the next Asian language I learn. Foreign currency is as fun as stamp collecting, if you go in for such things. I like a bill that gives me something to look at. The Malaysian ringgit is an attractive bill, and there are coins for smaller currency [we don’t have that in Cambodia]. As regards cleanliness, you get some bills in Lao and Cambodia that are crumbling and you know your really need to wash your hands after touching them. One hears this through the loudspeakers coming from the mosques throughout the day, starting as early as 6 a.m.. I’m sure it could get annoying over time, especially if one is particularly close to a mosque, but I rather like the singing parts of it, especially when they are sung well. Today my girlfriend said, “I keep waiting for the call to prayer to start”. After a short trip we miss the little audio breaks and reminders of the local religion and culture. Why settle for one when you can have all three in close proximity? It’s kinda’ like opting for the variety pack. 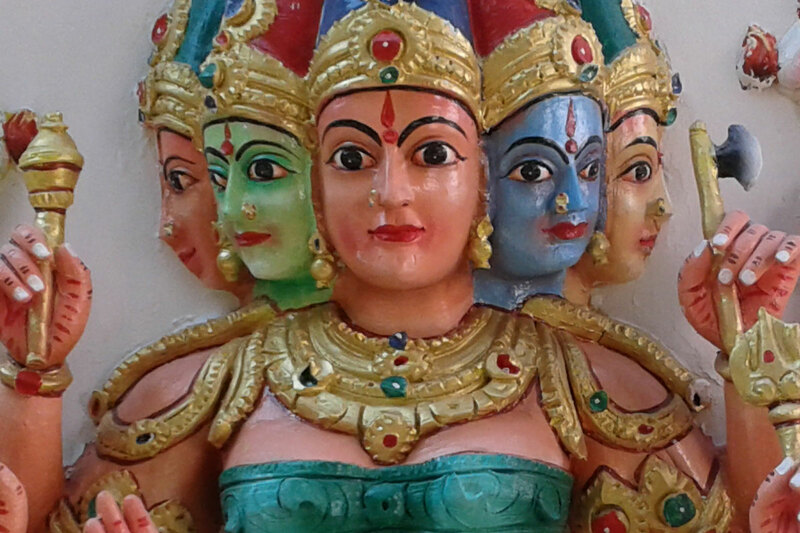 I’m a sucker for the painted figures in the Hindu temples. 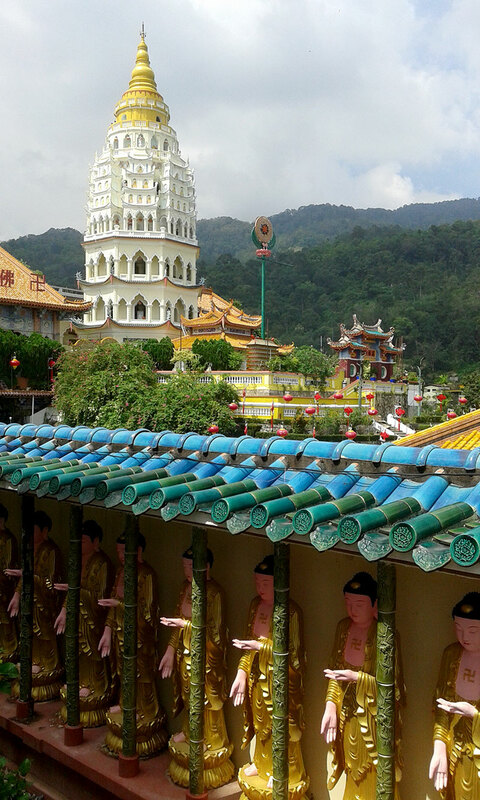 Kok Lok Si Temple Pagoda combines Muslim, Thai, and Chinese elements. The colonial influence is everywhere to be seen. 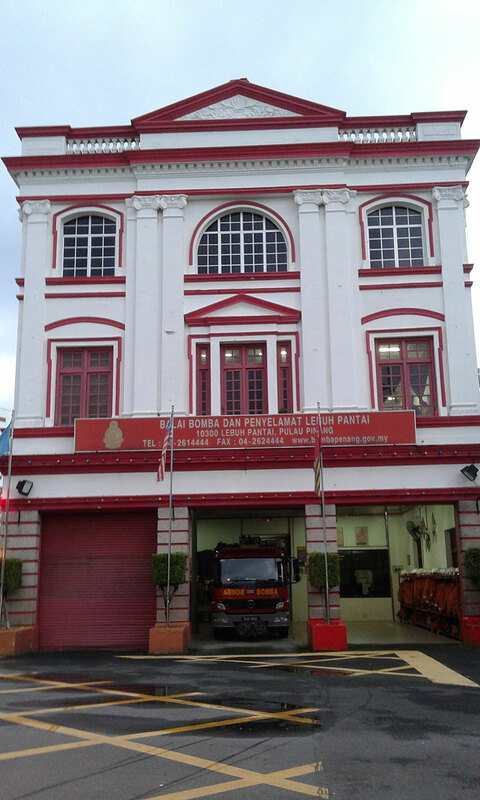 The fire station on Beach Street, below, for example, was constructed in 1908 and reflects the Edwardian style. 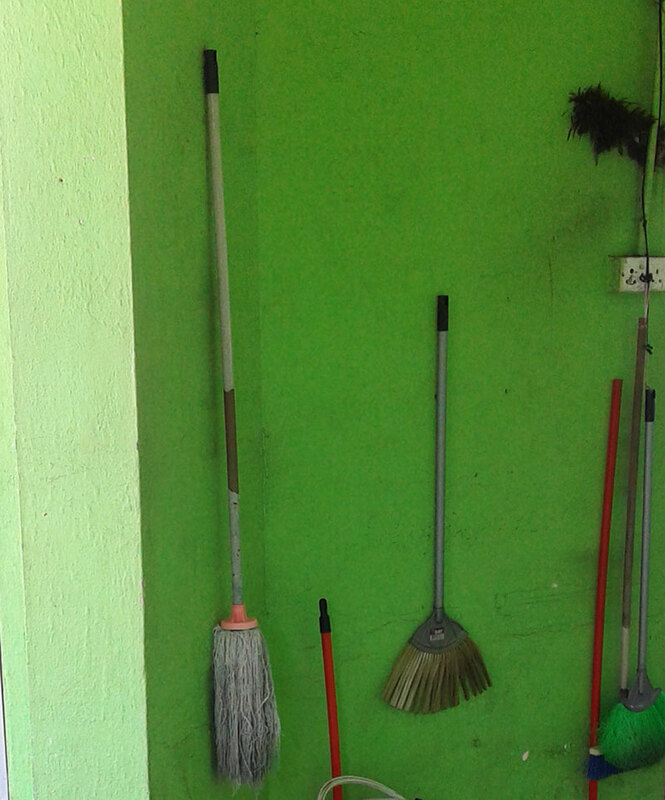 Even an ordinary business, like an adhesives shop, might be housed in a period building. 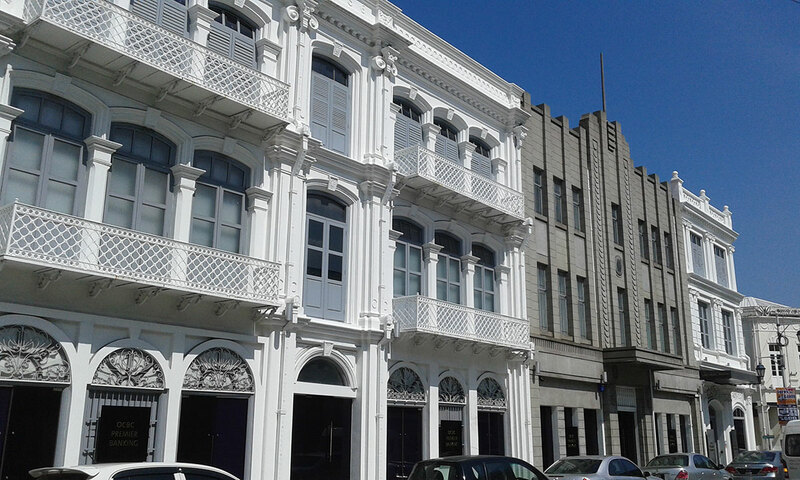 Well-preserved buildings in a banking area. 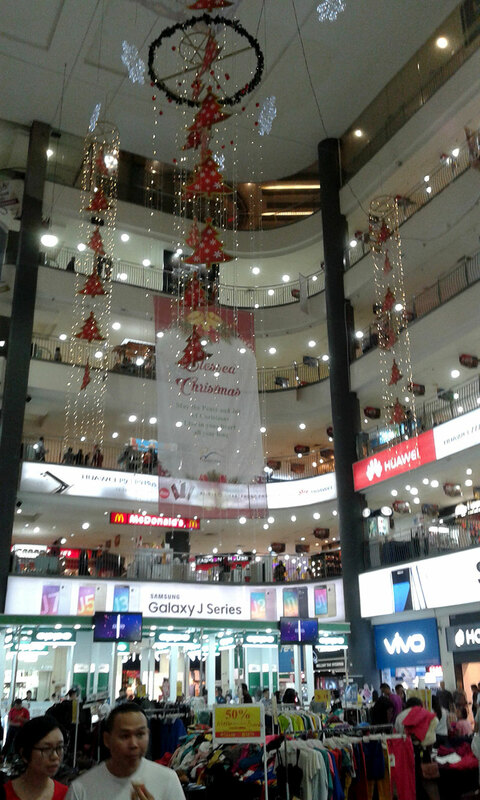 In Siem Reap we have one three story mall with about 4 stores on each level. It’s a square mall, and one side is just the facade with no stores. So, coming from SR (which, in case it seems like I’m dumping on it, has the most comprehensive food scene I’ve seen anywhere in Asia, largely due to, I think, foreigners being allowed to own businesses such as restaurants), a big mall is a big deal. 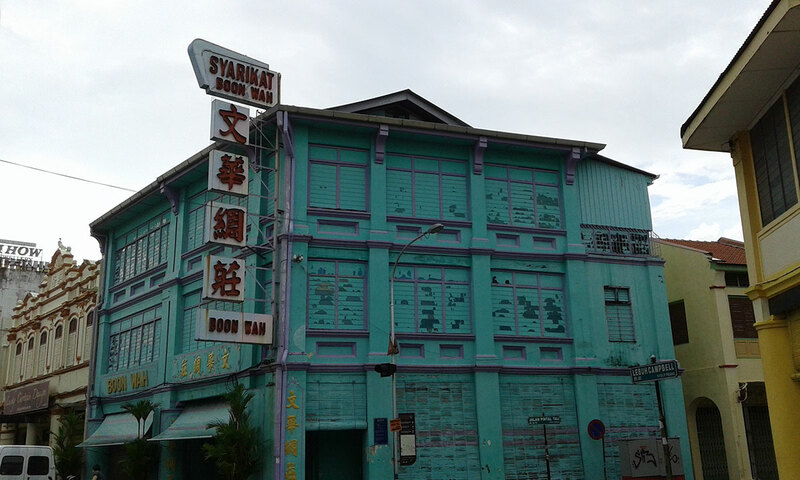 Our favorite was the Komtar Mall, which is the oldest mall in the city, and the most distinctly Malaysian. Many of the workers wear hijabs. Do I need to elaborate? There are excellent examples of all of these. 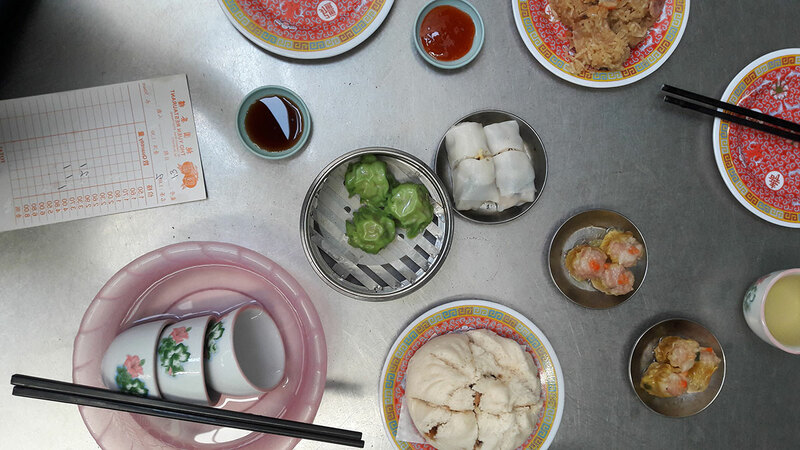 You can have authentic dim sum for breakfast, a Malay curry for lunch, and your favorite Indian specialties for dinner. All can be had for peanuts if one does a little research or just looks around a bit. Below some cheap Chao Mien, and the seller gave me the thumbs up for my accurate Chinese pronunciation (it’s not “chao-main” but “chao mee-un”). Excited about the soon to arrive curry, which was as good as any we’ve had anywhere. Trying a fried durian puff. Gooey, custardy, smelly goodness. Dammit, where’s my garlic naan set? Lani is still raving about that chicken. Not a plus for everyone, except the beautiful Chinese characters adorning placards for various shops. However, having lived nearly 5 years in China, my spoken Chinese is passably good when I can remember it, and it came in handy. 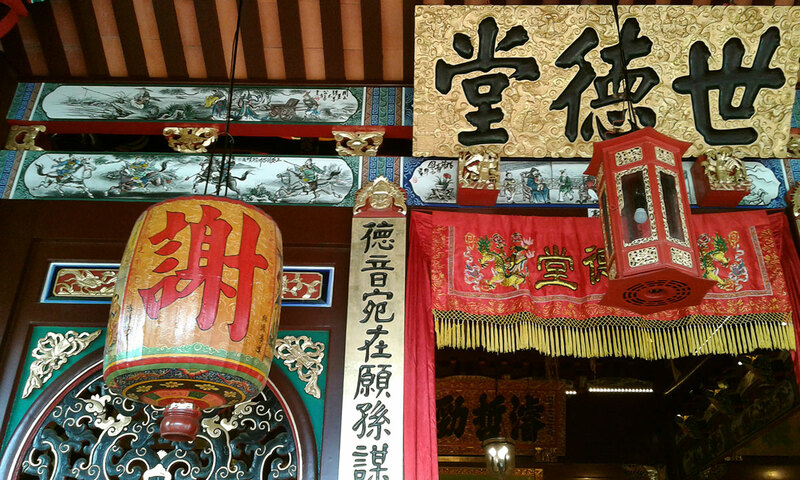 Although most everyone speaks some English, there were instances where it was just easier to speak Chinese. These were also sometimes funny, because, well, my girlfriend is biologically half-Chinese (and half Thai), though she looks 100% Chinese, but being an American, born in America, doesn’t speak a word of Chinese. 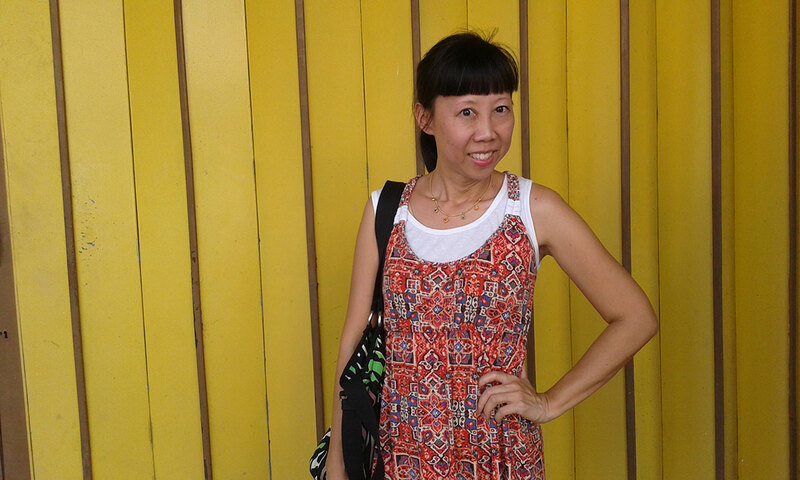 Of course the Chinese Malay’s all assume she simply MUST speak Chinese, because they do, and the ubiquitous Chinese tourists do, but naturally it doesn’t occur to them that I can speak it. 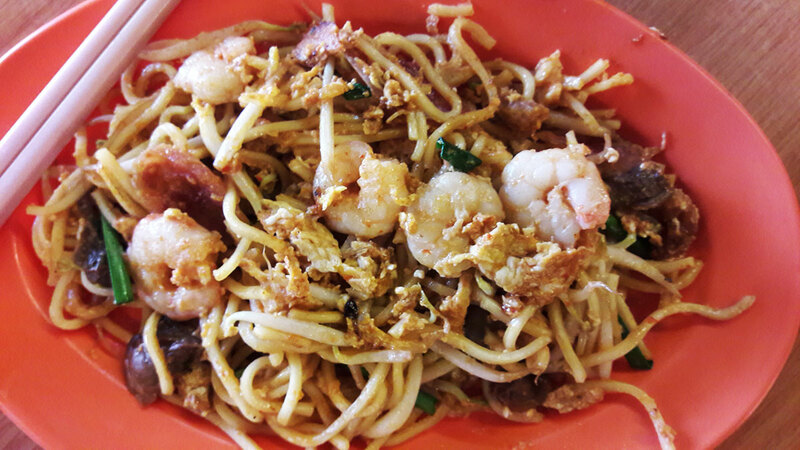 At one place, for example, she complemented the food to the owner, telling her it was “delicious”. The owner shrugged. “It’s very good”. Another shrug. So I piped in “hao chi”. Clarity at last, and the owner remembered me the net day and what I’d ordered. Chinese characters on the lovely, blue, Boon Wah building. In more rural China and Cambodia it’s very common to burn your garbage. And I don’t just mean perishable stuff like leaves and mowed grass. You burn mattresses, dirty diapers, used toilet paper, medical waste, and any and all forms of plastic, especially flimsy plastic bags. Nothing like a toxic whiff of that to encourage cancer. If you haven’t encountered bonfires of smoldering toxic garbage dotting the landscape, you don’t know the horror you are missing. You don’t have to breath that crap in Panang as far as I know. Nothing kills traveling across the world to see another culture and environment like seeing your typical Los Angeles style asphalt and concrete roads. I was teaching in Chiangmai, Thailand, when they decided to change the brick road that was the night market walking street into a paved road. They killed it. It went from a walking street with history and tourist appeal to a utilitarian runway for SUVs. Georgetown, on the other hand, has an abundance of cobblestone and granite sett roads, replete with decorative flourishes. So much better than generic asphalt. These sorts of designs were worth every ringgit it cost to make them. 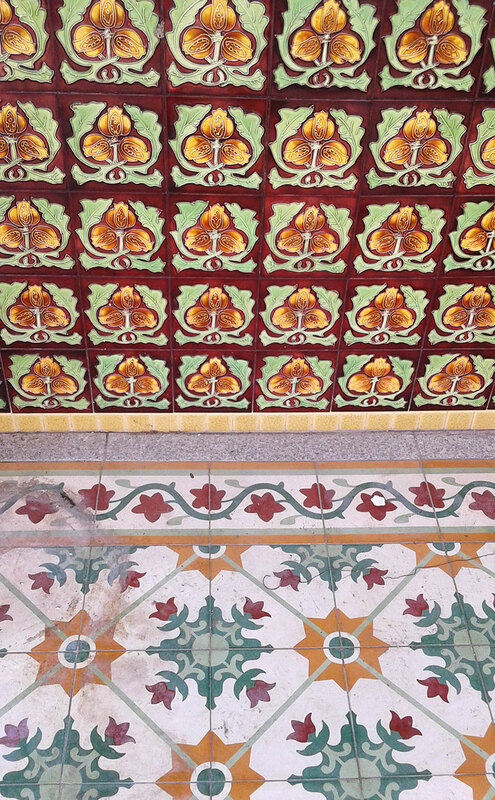 Tile means extraneous color and patterns. It’s amazing what a difference they can make. After living in China, which is mostly cement gray and lantern-red, especially inside of bathrooms, I moved to Vietnam, and my bathroom had blue and white diamond-shaped tiles. What a difference it made. It gave a crisp, light, and purposeful feel far removed from the dungeons of horror that are typical Chinese restrooms (if you’ve traveled much in china you know that’s not an exaggeration). Never underestimate tile. They are big on shutters in windows, and not the more flexible Venetian blind variety. My hotel room had them. You could look out, and mostly down, but you couldn’t look in. I’m guessing they like their privacy. From the outside, of course, the old shutters offer more opportunities for fading pastel colors and textural accents. The little details, like the sprig of basil in the curry, make life so much more pleasurable and reaffirming. When I was living in China and looking for new teaching jobs, I’d reject any city that didn’t have a river running through it. Without some sort of body of water, or other significant natural feature, I can feel lost in a flat concrete wasteland, especially in China. 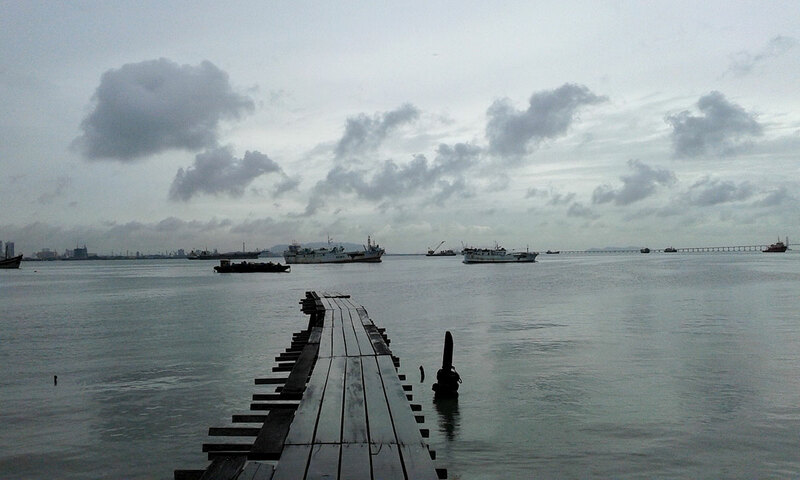 There’s nowhere in Penang, being as it is an Island, that is far from the sea. From my hotel I could easily saunter to a boardwalk along the ocean and look far into the distance at boats, clouds, and the horizon. 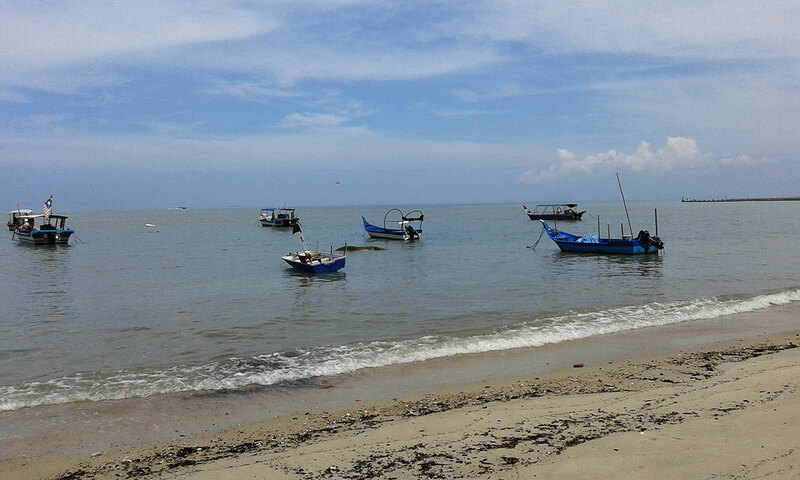 A 50 cent bus ride takes you to Batu Feringi beach. Batu Feringi beach. Mostly good for taking a relaxing walk along the shore. 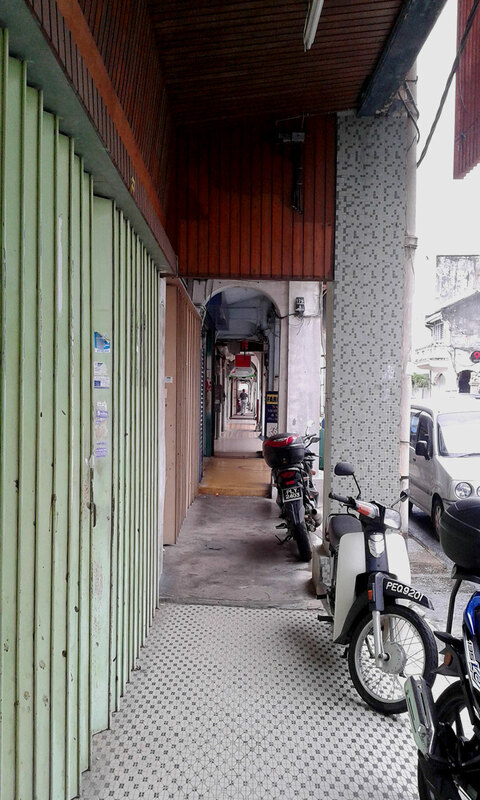 Walk to the seaside, or, to be more accurate, the Straight of Malacca. Last time I went to America, from China, I was shocked at how big the SUVs had grown since I’d last seen them. It’s as if they’d been exposed to radiation and mutated into giant versions of pickups. Soon thereafter these oversized trucks and SUVs started appearing on the undersized roads in Chiangmai and now in Siem Reap. A super-sized SUV is the vehicle of choice, and a status symbol here. 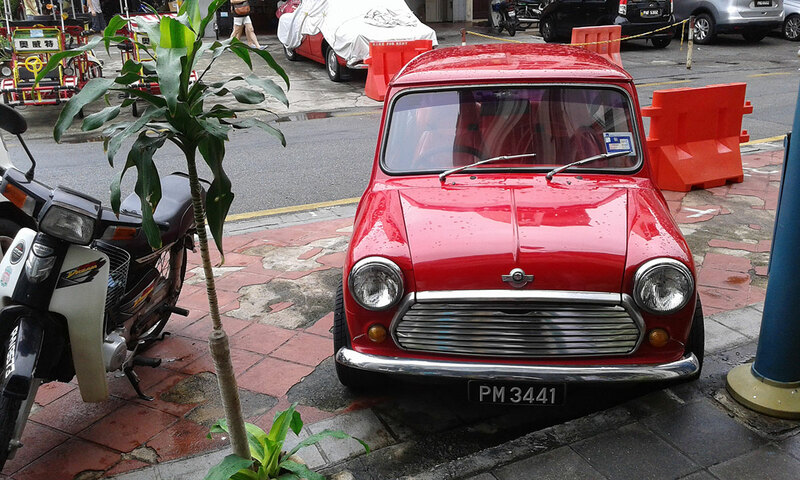 In Penang it’s an impractical curse on oneself that’s impossible to squeeze into spots requiring parallel parking. Most vehicles are smaller than average, and a bit older. It’s refreshing to see people tooling about in practical cars. All small cars here! Note blue sky. And some like to show off their classic small cars. 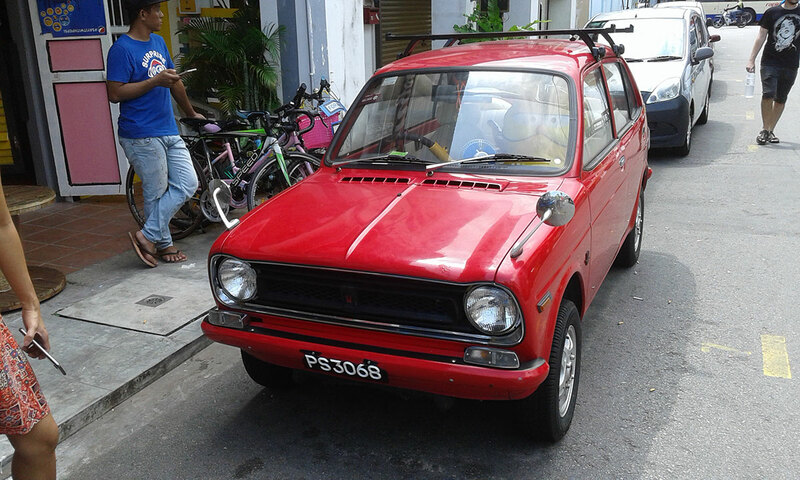 You can compensate for the diminutive stature of your car by painting it fiery red. 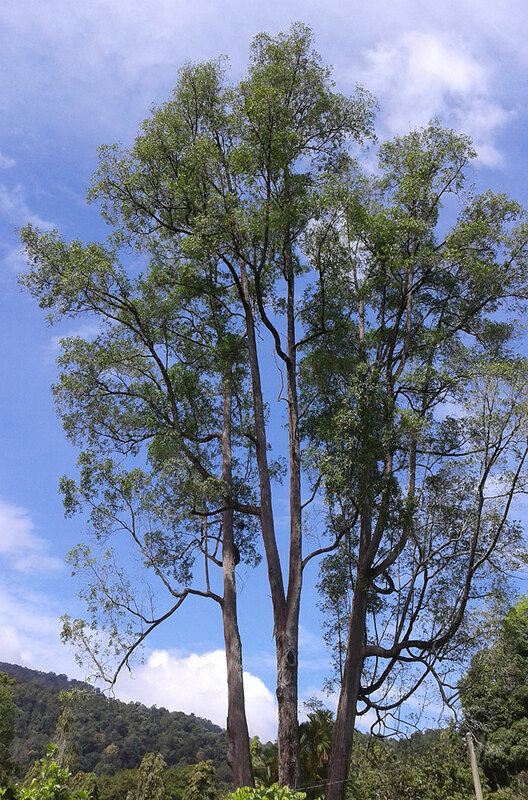 I’m sure the surrounding ocean helps enormously, but however you slice it, after the apocalyptic levels of pollution in China, the burning season in Chiang Mai and Chiang Rai, and the dust that’s perpetually kicked up in Siem Reap, a blue sky is a miracle. You have to be very careful of your step, as the open trenches along the walkways are hazardous to step into. I wasn’t present for a deluge, but I imagine the benefit of their presence is worth the risk of careless injury if they can handle heavy rain. 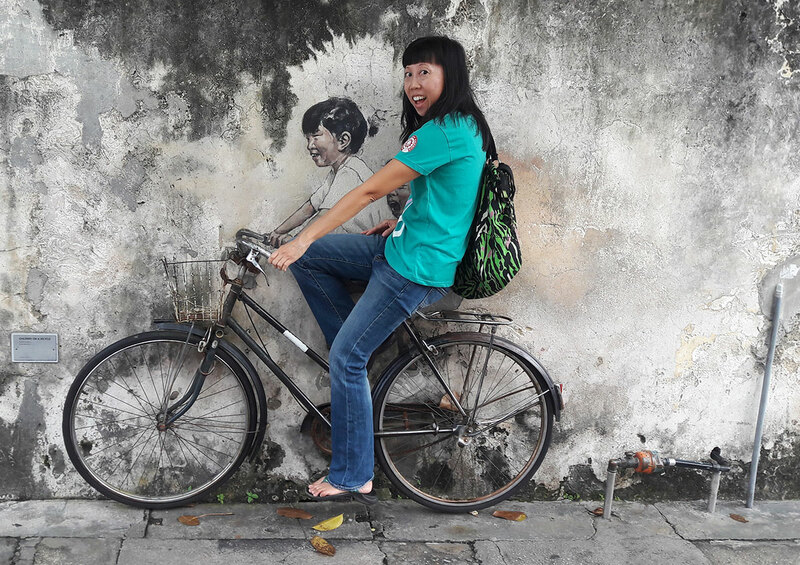 I recall arriving twenty minutes late to an evening class in Saigon, with soaked feet, when the roads became impassable by motorbike, even though I left an hour early in order to make it to class on time. Similarly, after even ten minutes of a tropical downpour in Siem Reap, I’ve cycled through instant ponds deep enough to reach my pedals. I forgot to take a picture of the drains. These are from a site dedicated to an infrastructure conservation project in Georgetown. Click on the image to visit the site. 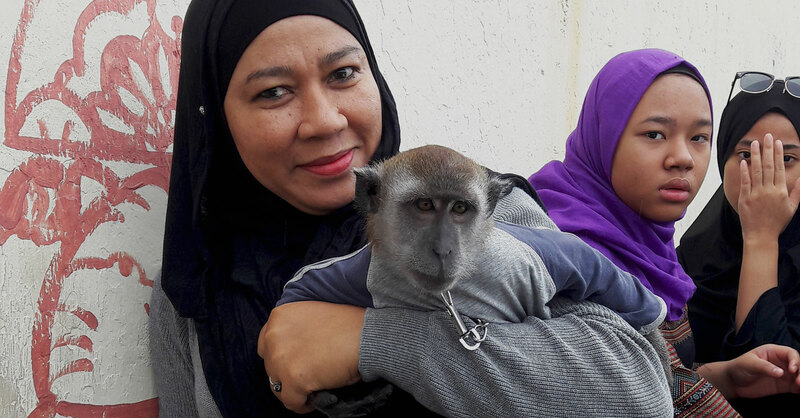 This lady had a pet monkey who eats rice, not bananas, and has a very long tail. Photo by Lani. 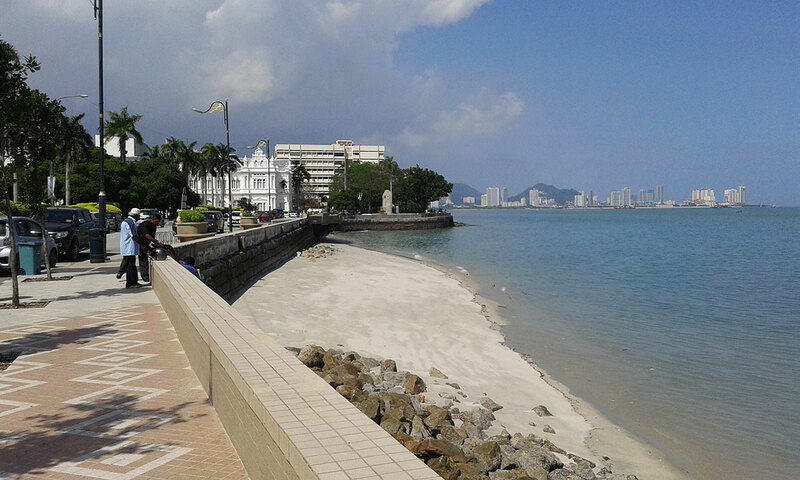 Penang is an ideal first destination in Asia, particularly is one doesn’t have a long vacation. It doesn’t have what I’d consider spectacular sites, and isn’t off the beaten path much, but gives exposure to multiple cultures in a small area, while allowing complete independence, and relative safety and cleanliness. The people in my experience were friendly and talkative if I initiated an exchange, polite, a bit reserved in a good way, and comparatively honest. Further, you could travel as cheaply as you wanted. There were dorm rooms for around $5, meals from food stalls or street hawkers running around $1.50 to $3, and the bus was less than $1. The beach, botanical gardens, and infinite walking around are free, as are many of the temples and mosques. There weren’t any downsides for this traveler, but I’d imagine if one’s goal were to drink lots and party down, a predominantly Muslim country wouldn’t be the best place to do it. Lastly, I was only there a week, so, my impressions are all within the honeymoon phase, though that phase has been remarkably shorter in other countries. If you stop and look, there are lots of small monitor lizards at the Botanical Gardens. They weren’t afraid of me. I love lizards, so just had to include this. I’ve read that Malaysia is a very popular retirement option for expats. Noted for future reference. 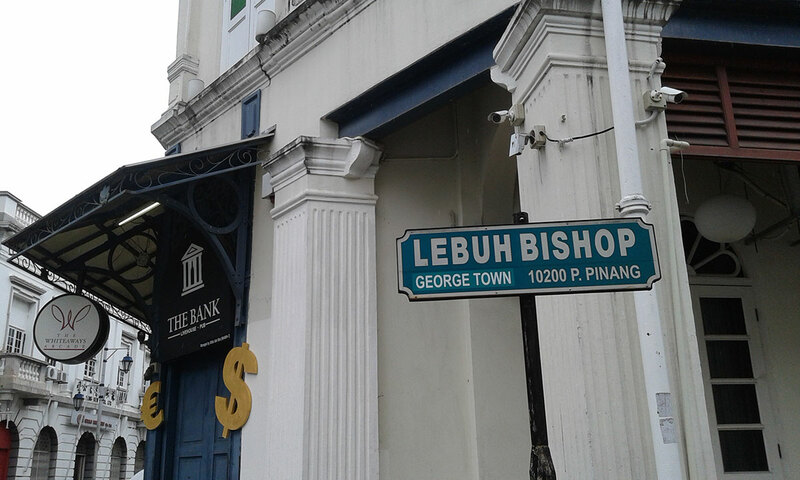 Posted in travelogueTagged architecture, colonial, Georgetown, Malaysia, Penang, SE Asia, SE Asia travel, travelBookmark the permalink. With observational perception and reflection on the order of Jan Morris and Paul Theroux, Mr. Wayne’s travel writing virtually immerses a reader in the rich realities of both the places he shares so vividly and the resonance of the actual experiences he inhabits. Lovely!